A song from my youth carries the title, which repeats in the chorus, “They’ll know we are Christians by our love.” If you’re not familiar with this song, check out the lyrics or watch a video. Though not the style of music I listened to then or prefer now, the haunting melody drew me in and served as a bridge to connect my growing, yet questioning, faith with the 60s Jesus movement, for which I was born a bit too late. Christian love became my focus in all that I did. 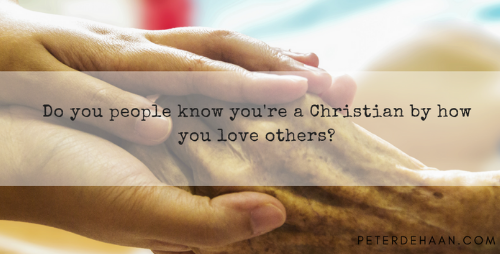 This phrase, “They’ll know we are Christians by our love,” became my anthem then and persists today as a key guiding principle for life and living. In Paul’s popular teaching on love in 1 Corinthians 13, he ends by saying that three things will last forever, faith, hope, and love. And in this trio, love stands above the other two. That means, love is the greatest thing (1 Corinthians 13:13). The biblical basis for this song’s title and chorus is perhaps John 13:35, where Jesus says to his disciples that everyone will know they follow him if they love each other. That is, “They’ll know you’re my followers by your love.” Of course, the Bible has many other verses about love and the importance of loving one another. When we truly love one another, we point people to Jesus. Isn’t that our purpose? A secondary theme in this song is unity, specifically Christian unity. It says we are one in the Holy Spirit and one through Jesus. It also prays for the restoration of unity and ends with an acknowledgment that the Holy Spirit unites us. Sadly, our world today does not celebrate Christianity for our love or our unity. Instead too often society views Christians as purveyors of hate and the cause of division. Our 42,000 Protestant denominations prove that we can’t get along and don’t care about unity. The world hears these messages and rejects Jesus because of them—because of us. Instead we must pursue Christian love and unity. And not just for the sake of love and unity, but for the sake of pointing people to Jesus. May the world know we are Christians because we love one another, and may they know we are Christians because we all get along. If we can master Christian love and unity, everything else will fall into place.